If your web usage consists mainly of browsing websites, checking e-mail, and doing some online shopping, our Silver Package, Internet and TV Package or 20 Mb service will easily meet your needs. The Gold Package or our 45 Mb internet option is ideal for the household interested in streaming online content while having multiple other devices connected at the same time. 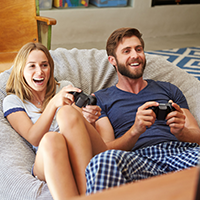 Do you have a home full of online gamers? Or maybe your home is filled with devices connected to the Internet at all times of the day. If this sounds like your house, we highly recommend the Platinum Plan or our 95 Mb service. They have the speed you need to keep everyone in your home happy. See how long it takes each of our service packages to download an HD movie (5 Gigabytes of data). Please contact our friendly customer support team. They’ll visit about how you use the Internet and recommend a package that best meets your needs.